The extraordinary success of Dan Brown's bestseller Angels and Demons, and the not less extraordinary reaction of the CERN laboratory Spotlight on Angels and Demons, demonstrate how difficult it is to have a rational discussion on the military implications of so-called pure scientific research, i.e., of the kind that is carried out at CERN. The point is that for over twenty years reputable scientists have tried to open a debate on the very serious military implications of the antimatter research carried out at CERN and at similar laboratories around the world. This has led to a whole series of technical-level publications, mostly in scientific journals, as well as to a number of papers in leading journals such as The New York Times ( Huge production of antimatter planned , 27 August 1985, p. C1 and C3) and Nature ( Antimatter underestimated , 26 February 1987, p. 754), which however have received very little attention. As an example of a general-level publication (with references to more technical publications) calling for a debate on the prospect of antimatter bombs, and on the role of laboratories such as CERN in the research related to these weapons, we are posting the paper below which was first published in French (La Recherche, Paris), then twice in English (The World Scientist, New Delhi, and Bulletin of Peace Proposals, Oslo), then further translated in full or in part into other languages including Finnish, Russian, Polish, etc. Concerning Dan Brown's book, as well as CERN's reply to it, there are numerous (technical and political) mistakes in both. In particular, the most important technical mistake is to suggest that large quantities of antimatter are needed to make a very powerful bomb: this is wrong. As is explained below, and confirmed by numerous professional publications (see three recent ones at the end of this Web page), tiny amounts of antiprotons are sufficient to initiate huge thermonuclear explosions. Indeed, on the order of one microgram of antiprotons (or antihydrogen) is enough to trigger a multi-ton or multi-kiloton thermonuclear explosion! At CERN (the European Laboratory for Particle Physics), on the evening of the 17 to the 18 of July 1986, antimatter was captured in an electromagnetic trap for the first time in history. Due to the relatively precarious conditions of this first successful attempt, it was only possible to conserve the antiprotons for about ten minutes. This was, nevertheless, much longer than the Americans Bill Kells of Fermilab and Gerald Gabrielse of the University of Washington had hoped for. When these researchers return to CERN for another attempt, an improved apparatus will permit them to literally 'bottle' several tens or hundreds of antiprotons. Ultimately, the perfection of this technique will allow them to carry home a substance infinitely more rare and difficult to obtain than a piece of the Moon. They would thus be able to complete, in their own laboratory, a most important experiment for the theory of the unification of the fundamental physical forces, that of comparing, with a precision greater than one part per billion, the masses of the proton and antiproton. Some other American Scientists, this time coming from the Los Alamos military laboratory (where the atomic bomb was perfected during the Second World War), are also at work in Geneva. In a few months time, using many more resources and more sophisticated equipment, they also expect to capture and bottle antiprotons, but in much greater quantities. They will, as the group from the University of Washington, strive to divulge the difference in mass between the proton and its antiparticle. But, they will also attempt a number of complex manipulations such as, the production of antihydrogen, the injection of antiprotons into superfluid helium, the search for metastable states in ordinary matter, etc. Various crucial experiments that should, in the near future, help to determine whether or not antimatter could become a new source of nuclear energy for civilian and military applications. For the more delicate experiments, they could certainly bring their vintage 1987 or 1988 bottles of antimatter to Los Alamos. There, up in the peaceful mountains of New Mexico, they could perfect nuclear weapons free of radioactive fall-out, beam weapons projecting thermonuclear plasma jets, gamma- or X-ray lasers, or other still more secret weapons, all triggered by antimatter. Whether antimatter triggered thermonuclear weapons are realizable or not, or whether other weapons using annihilation energy are feasible or not, the fact that a relatively small quantity of antimatter can set off a very powerful thermonuclear explosion creates serious problems for the future of the strategic balance. In fact, the arms control treaties presently in force deal only with fission related devices and materials : atomic bombs, nuclear reactors and fissile materials. By removing the fission fuse from thermonuclear weapons, antimatter triggered H-bombs and neutron bombs could be constructed freely by any country possessing the capacity, and be placed anywhere, including outer-space. Then again, even if technical obstacles prevented, for example, the actual construction of battle-field antimatter weapons, antimatter triggered microexplosions would still allow small and middle sized thermonuclear explosions to be made in the laboratory. This possibility would considerably reduce the need for underground nuclear explosions, thus rendering ineffective any attempt to slow the arms race by an eventual comprehensive nuclear test-ban treaty . A nuclear test laboratory of this type could be based around a large heavy-ion accelerator , which would provide a means of massive antimatter production, as well as a driver to study the compression and explosion of thermonuclear fuel pellets. J. Grinevald, A. Gsponer, L. Hanouz et P. Lehmann: La quadrature du CERN. Editions d'En Bas, CH-1017 Lausanne (1984). E. Fermi and E. Teller: The capture of negative mesotrons in matter. Phys. Rev. 72 (1947) 399--408. A. D. Sakharov: Oeuvres scientifiques, Editions anthropos, Paris (1984). J. Ashkin, T. Auerbach and R. Marschak: Note on a possible annihilation process for negative protons. Phys. Rev. 79 (1950 ) 266--271. H.-P. Duerr and E. Teller: Interaction of antiprotons with nuclear fields. Phys. Rev. 101 (1956) 494--495. At the end of 1986 an antiproton production and cooling system will be put into operation at Fermilab, near Chicago. However, there are no definitive plans to construct a deceleration system such as LEAR (Fig.1). As far as the Soviet Union is concerned, few details are available on the status of their projects with antimatter. M.R. Clover et al. : Low energy antiproton-nucleus interactions. Phys. Rev. C26 (1982) 2138-2151. A. Gsponer and J.-P. Hurni: Antimatter induced fusion and thermonuclear explosions. Atomkernenergie--Kerntechnik 49 (1987) 198--203. B.W. Augenstein: Concepts, problems, and opportunities for use of annihilation energy. Prepared for the United States Air Force, RAND Note N-2302-AF/RC, June (1985). N. A. Vlasov: Annihilation as an energy process. Soviet atomic energy 44 (1978) 40--45. A. Gsponer and J.-P. Hurni: A href="http://www.arXiv.org/abs/physics/0507114">The physics of antimatter induced fusion and thermonuclear explosions. Proceedings of the 4th International Conference on Emerging Nuclear Energy Systems, Madrid, June 30/July 4, 1986 (World Scientific, Singapore, 1987) 166--169. W.Saylor, S. Howe, D. Holtkamp, M. Hynes (invited paper): Antimatter production factory - systems tradeoffs. M.H. Holzscheiter: Antiproton storage - A new concept for future energy systems. L.J. Campbell: Antiproton storage in condense matter - The promise, the prospects. S. Howe (invited paper): Use of antimatter annihilation products to produce usable power for space based applications. N.B. : Steve Howe, of the Los Alamos National Laboratory, who authored two out of the four withdrawn communications, is the "physicist and follow scribe" mentioned by Dan Brown in the acknowledgments of his book Angels and Demons. A. Gsponer, B. Jasani and S. Sahin: Emerging nuclear energy systems and nuclear weapon proliferation. Atomkernenergie/Kerntechnik 43 (1983) 169--174. C. Deutsch: Inertial confinement fusion driven by intense ion beams. Annales de Physique 11 (F�vrier 1986) 1--111. It is possible to construct a thermonuclear weapon in which the three to four kilograms of plutonium, necessary for the ignition, are replaced by one microgram of antihydrogen. In this hypothetical bomb, the antimatter is in the center in the form of a pellet a tenth of a mm in diameter. 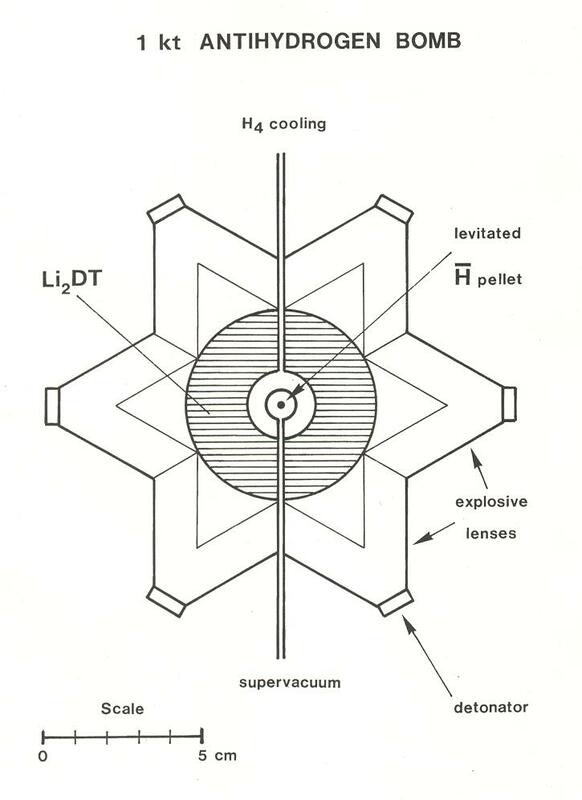 It is surrounded by, and isolated from, the thermonuclear fuel (a 100 g hollow sphere of Li2DT). After compression by explosive lenses, the fuel comes into contact with the antihydrogen. Annihilation reactions start spontaneously, providing the energy to ignite the thermonuclear fuel. If the chosen degree of compression is high, a bomb with increased mechanical effects is obtained, and if it is low, a neutron bomb (see La Recherche September 1983). In both cases the electromagnetic pulse effect and the radioactive fall-out are substantially lower than that of a conventional A- or H-bomb of the same yield (1 kt). Relativistic quantum theory predicts the existence of two types of elementary particles appearing on an equal footing with respect to the fundamental equations. Thus, for each particle there exists an antiparticle having the same mass and spin but opposite electrical charge. Furthermore, particles and antiparticles can appear or disappear in pairs, due to the transformation of energy into matter and vice-versa. Antiprotons and positrons are probably the only forms of antimatter that will be able to be fabricated, in substantial quantities, in the near future. They are produced by accelerating protons (or other particles) to energies such that, when they collide with a target, a part of the energy is transformed into particle-antiparticle pairs. In practice, when using a fixed target, as a function of invested energy, the maximum antiproton production yield occurs when the protons are accelerated to an energy of about 120 Gev. Since less than one collision out of thirty produces an antiproton, and since the mass of an antiproton corresponds to only 0.94 GeV, the energy efficiency is very poor. From this point of view, a better solution would be to use a collider-ring in which the antiprotons would be produced by the head-on collisions of protons turning in opposite directions. In theory, an even higher yield could be obtained if conditions similar to the original "Big Bang" could be recreated in the laboratory, conditions in which proton-antiproton production becomes spontaneous. Such conditions might be found in quark-gluon plasmas, which could be produced in high-energy heavy-ion collisions, which are presently the subject of intense research [C]. Once the antiprotons are created (with a whole spectrum of velocities and directions), the following step consists of capturing them before they interact with matter. This is a problem much more difficult to resolve than that of production. It took almost thirty years before a solution was found at CERN. This required the invention of "stochastic cooling", a technique to decrease the width of the antiproton velocity distribution (see La Recherche April 1984 p.508-511). It is then possible to concentrate the collected antiprotons into a very small beam, to accumulate them in storage rings, and finally slow them down to energies such that they can be brought to a standstill in electromagnetic traps. In a Penning trap, particles are radially confined by a magnetic field, and axially by an electrostatic field. A cylindrical trap of this type served as host during the recent experiments at CERN in which antiprotons were bottled for the first time. It also trapped continuously a single electron for more than ten months at the University of Washington. To store antiprotons for years, one needs a vacuum better than 10-18 torr. This is obtainable only in enclosures that are sealed (after filling) and cooled to the temperature of liquid helium. 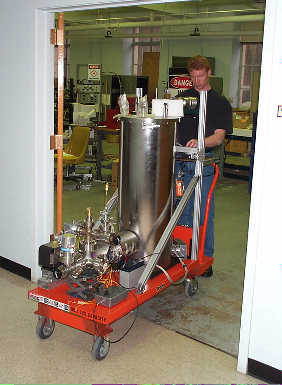 It is therefore practically impossible to measure the vacuum level, so that doing the experiment itself is the only way to verify the technique. If this method is successful, it will be possible to make transportable bottles with a capacity of 1012 to 1013 antiprotons [E]. Then the decisive stage for the practical applications of antimatter will begin: will it be possible to develop adequate simple and compact storage techniques? For this, two major approaches are being considered. The first consists of making antihydrogen by combining antiprotons with positrons, and then trying to form solid antihydrogen pellets which could be stored and manipulated with the help of various electromagnetic and optical levitation techniques. Very high storage densities would be obtained, but only in cryogenic enclosures and extremely good vacuums. The most appealing approach would be to store the antiprotons in ordinary matter. In fact, if all antimatter particles have a tendency to spontaneously annihilate when coming into contact with matter (be it the effects of electromagnetic attraction in the case of positrons and antiprotons, or van der Waals forces for antihydrogen), the existence of metastable states of antiprotons in condensed matter can not be ruled out a priori [F]. For example, if a very low energy antihydrogen atom is diffused into a solid, it moves about until its positron annihilates with an electron. The antiproton may then take the place of this electron, and under some conditions, remain confined at certain points within the crystalline structure. At present the kind of substance to be used isn't known, but an enormous variety of chemical compounds and crystal types are available for the search of an optimum material. Other less obvious solutions could still be discovered. For example, antiprotons might, as electrons do when placed in liquid helium, form a bubble at the center of which they could subsist indefinitely [F]. Also, similar to the electron pairs responsible for superconductivity, antiprotons might possibly form Cooper pairs if placed in a metal, becoming thereby unable to lose kinetic energy by shock, and thus to annihilate. Lawrence Livermore National Laboratory, Livermore, U.S.A. : On the Utility of Antiprotons as Drivers for Inertial Confinement Fusion by L. John Perkins, Charles D. Orth, Max Tabak, published 2004, pdf format. Los Alamos National Laboratory, Los Alamos, U.S.A. : Controlled antihydrogen propulsion for NASA's future in very deep space by M.M. Nieto, M.H. Holzscheiter, and S.G. Turyshev, published 2004, pdf format. Ioffe Physical Technical Institute, St. Petersburg, Russia : The typical number of antiprotons necessary to heat the hot spot in D-T fuel doped with U by M.L. Shmatov, published 2005, pdf format.